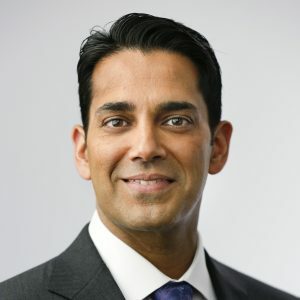 Suken A. Shah, MD is a pediatric orthopaedic and scoliosis surgeon and serves as Associate Professor of Orthopaedic Surgery and Pediatrics at Sidney Kimmel Medical College of Thomas Jefferson University. Dr. Shah is certified by the American Board of Orthopaedic Surgery. His clinical interests include adolescent idiopathic scoliosis, early onset scoliosis, osteogenesis imperfecta, cerebral palsy, complex spinal deformities, kyphosis, spondylolisthesis and minimally invasive techniques for surgery. He is an innovator, researcher and key opinion leader in the field of spinal deformity surgery and performs advanced deformity correction techniques. He has been asked to give Grand Rounds and/or visiting lectureships at over 25 universities or institutions and has served as faculty or chairman of 55 conferences, written 125 research publications in peer-reviewed journals, 22 book chapters, was a section editor of Orthopaedic Knowledge Update – 9, Neuromuscular Scoliosis, two specialty supplements in the Journal of Pediatric Orthopaedics and Seminars in Spine Surgery and co-edited a textbook on The Management of Disorders of the Child’s Cervical Spine. He also serves as a reviewer for five medical journals. Distinctions include the Scoliosis Research Society Traveling Fellowship, Best Doctors in America (2007-2017) and the ABC Traveling Fellowship from the American Orthopaedic Association. In 2014, he was named one of the Top 17 Pediatric Orthopedic Surgeons in the United States by Orthopedics This Week. Dr. Shah serves on the Board of Directors of the Scoliosis Research Society as the Education Council Chair-elect. He is active member of POSNA and serves on the IPOS Advisory Board. He is a member of multiple research study groups and a board member of the Setting Scoliosis Straight Foundation.